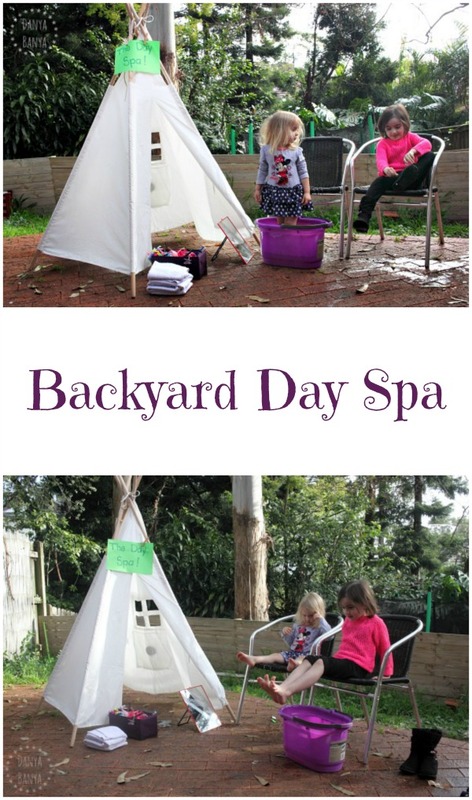 Set up a backyard day spa, for some pampering fun at home. I can’t believe it’s been nearly a year since we did this activity, and I’m only just finding the time to write it up. The saying “the days are long but the years are short” is certainly true when you have little munchkins underfoot! 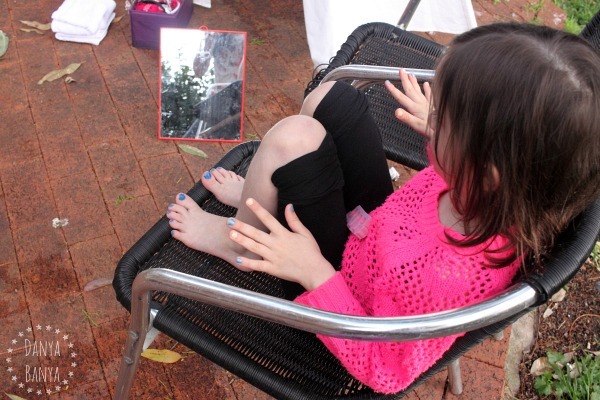 Essentially the idea behind this activity is very simple – take some of our normal self-care activities outside, add a bit of extra pampering, and end up with a very girlie and special afternoon! 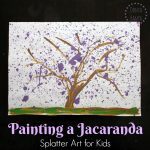 It’s a great activity for multiple age groups – when we did this, JJ was 5 years old and Bee was almost 3. 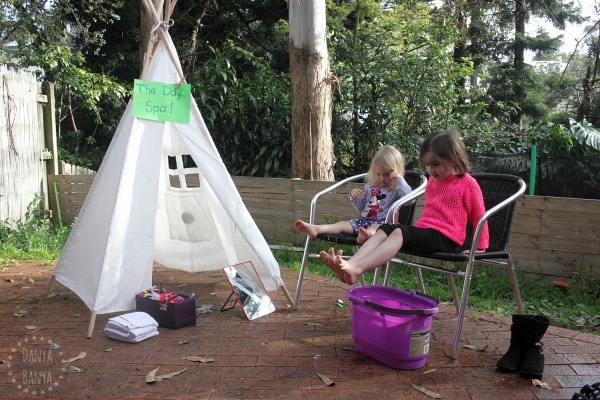 We used the teepee to help ‘set the scene’ and give our day spa a base where we could store our supplies. 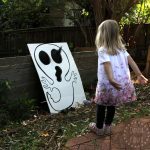 You could also use a cubby house, create a makeshift fort, or skip this step if you like. 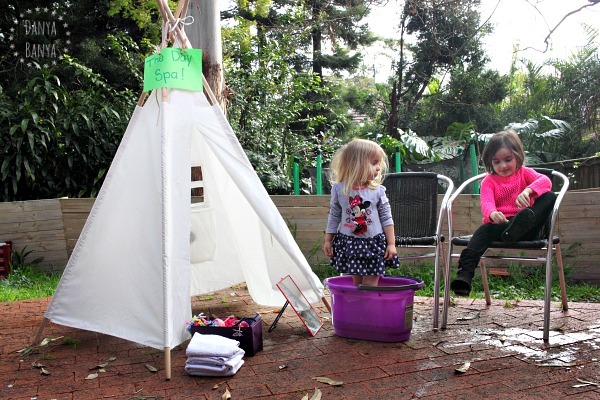 (Disclosing that we were originally gifted our teepee from Finlee & Me as part of a sponsored post on Good Old-Fashioned Backyard Play, just fyi. Then, while their nails were drying, I brushed their hair and gave them a head massage. Ahh, it’s lovely to feel pampered! Let the kids take the lead, with these 8 tips on encouraging good old-fashioned backyard play. 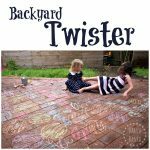 You just need pavers and chalk to create your own fun game of backyard twister! Using chalk on pavers again, make a number grid for some gross motor number recognition play, or for some hands-on reading (and scrubbing) of sight words, letters or shapes. Add a DIY fairy door to a tree stump or fence, to invite some whimsical imaginative play. 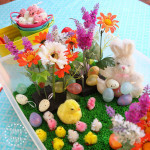 Or you could make your own fairy garden! Conduct a little home science experiment to discover what lives in the dirt in your backyard. Try this at different times of year, and see if you get different results. Then you can use some of that dirt for this planet earth craft idea. Water beads are an amazing sensory material for the warmer summer months. We used some in this ocean sensory tub, which was a big hit for my marine-loving girls. 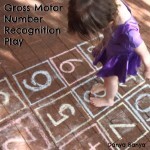 Or if you have a trampoline, this number recognition jumping game was easy and fun. JJ asked to do this over and over again! Disclosure: just FYI that I originally received this teepee as part of a sponsored post (but that agreement didn’t include writing this additional post, which I’ve done of my own discretion). All opinions are my (or my kids’) own. Previous: Is your child interested in letters, numbers or shapes? Playing ladies is fun for older girls too. Your little munchkins, will be ladies one day – but not too soon.